Larkya peak is situated in the Manaslu Himal range in the western part of Nepal in Gorkha district at an elevation of 6,249m. Larkya peak is very attractive tricky and hard to fine top to bottom with the wonderful panoramic view point to admire the lofty mountain top like Manaslu, Ganesh Himal, Annapurna, Buddha Himal and Himalchuli, the trail continue northward passing through many villages of Tibetan origin. Larkya peak is rarely climbed peak till now.There is often confusion however about which peak it is and groups are often lead up a steep line to a subsidiary peak known as Sano (small) Larkya (5,807 m). Base camp is close to the Larkya La, a pass of 5,135 m. Sano Larkya Peak can be climbed in a long day from this base camp. However, to climb Thulo (big) Larkya (6,249 m), a high camp is needed. The Climbing route of the trekking peak is Gorkha-Dharache dada - Samagoun-BC, Summit Larkya peak and exit at Besisahar. There are 3 different caravan for this peak climbing; either from Arughat, or Barpak-Laprak or Dharache dada. Larkya Peak's caravan from Barpak-Laprak and Dharache dada is better for the well acclimatization with a panormic views of Annapurna range, Langtang Himal ranges, Himalchuli, Boudha Himal, Sringi Himal and many more mountain with the bio-diversity of culture and tradition enroute. Basically, one can experience the lift time oberservation of Gurung community. The trail continues northward passing through many villages of the Tibetan origin. Day 01: Arrive in Kathmandu, transfer to Hotel. And welcome dinner in the evening. 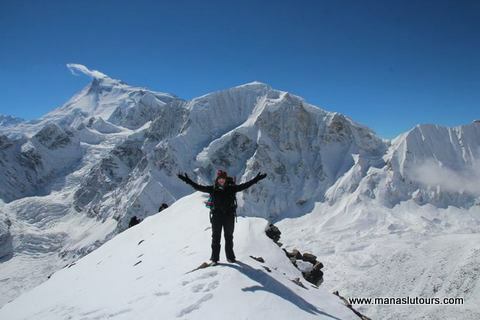 You'll be met at the airport by a representative from the Manaslu Tours. Our representative will transfer to Hotel and will have welcome drink in the evening at the traditional Nepalese cuisine. Above mentioned Trip dates are the fixed departure date for Larkya Peak 2019. The cost mentioned in the tables are the cost from 6 to 12 peoples in a group. This trip can only be organized for minimum of two people upon your request. A group booking of 10 or more people is subjected to a maximum discount with the availability of free trip to one person. If your group is much larger please contact us to discuss about the price.